Not sure if your attempts at teaching your child how to handle money are really working? Just look for these clues. 1. Your kid asks for money to buy specific things. This may sound like a no-no, but when your son asks for money to buy a cool gadget, it shows that he’s done some prioritizing of what he wants. And if he asks for an exact amount, that’s great. “When your child knows how much he’s spending on a particular item, it’s a ‘planned purchase’ versus buying something impulsively,” says Candi Sparks, author of the Can I Have Some Money? book series. Of course, that doesn’t mean you have to buy it for him! 2. Your kid is always digging in your coin purse. Counting coins makes for a fun math activity that doubles as a money lesson. So if your child digs in your purse for coins to count or asks to count out change for you when you’re shopping, he’s learning both. 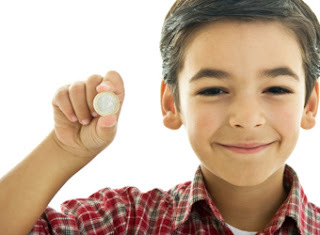 Challenge older kids to guess how much change you'll get back at the register. 3. Your child asks for his own bank account. When this day comes, don’t dismiss it with a “You’re too young.” Your child is showing that he identifies with the way adults handle money. “When kids have their own bank account, they learn that money grows at the bank—not on trees!—by making interest on deposits,” says Sparks. 4. Your child likes to play the energy cop. When your kid keeps reminding you to turn off the lights or stop running the water, he’s not just being bossy—he’s being economical. “By equating money with lifestyle choices, he’s learning how to get more bang for his buck,” says Sparks. Plus, he’s saving the environment. 5. Your child wants to buy you a gift. When your little one offers to buy you something, it’s a heart-warming sign that he doesn’t mind using his own money to take care of a loved one. “Your child realizes that you need money to provide your loved ones with the basics, like food, shelter, and clothing, but money isn’t the most important thing in the world,” says Sparks.